What is it like to become an adult in twenty-first-century America? This book takes us to four very different places—New York City, San Diego, rural Iowa, and Saint Paul, Minnesota—to explore the dramatic shifts in coming-of-age experiences across the country. Drawing from in-depth interviews with people in their twenties and early thirties, it probes experiences and decisions surrounding education, work, marriage, parenthood, and housing. 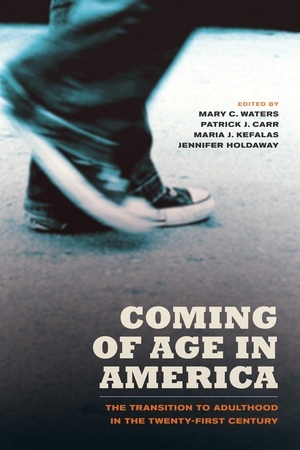 The first study to systematically explore this phenomenon from a qualitative perspective, Coming of Age in America offers a clear view of how traditional patterns and expectations are changing, of the range of forces that are shaping these changes, and of how young people themselves view their lives. Mary C. Waters is M.E. Zukerman Professor of Sociology at Harvard University. She is author most recently of The Next Generation: Immigrant Youth in Comparative Perspective, and of Ethnic Options: Choosing Identities in America (UC Press), among other books. Patrick J. Carr is Associate Professor at Rutgers University. He is the author of Clean Streets: Controlling Crimes, Maintaining Order, and Building Community Activism and Hollowing Out the Middle: The Rural Brain Drain and What it Means for America. Maria J. Kefalas, Professor in the Department of Sociology at Saint Joseph’s University, is the author of Promises I Can Keep: Why Poor Women Put Motherhood Before Marriage (UC Press) among other books. Jennifer Holdaway is Program Director and China Representative at the Social Science Research Council. She is the author most recently of Environment and Health in China: Cross-disciplinary Perspectives. "Much hand-wringing has occurred over the so-called failure of young people to grow up today. This volume persuasively shows the range of forces that shape the protracted transition to adulthood. An excellent and enjoyable read." --Deborah Carr, Professor of Sociology, Rutgers University, and editor of the Encyclopedia of the Life Course and Human Development.